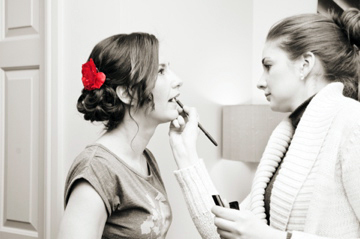 Professional Bridal makeup and hair is vital for a bride who wants to look outstanding on her wedding day. Victoria has extensive experience working with many brides, bridesmaids and mother of the brides so you can be confident that the look we create together for your big day will be perfect for you and to guarantee those amazing photographs. Victoria understands the importance of your makeup lasting from day to night and through tears of joy and happiness, which is why she uses only the highest quality make-up. From brands such as Laura Mercier, Bobbi Brown, MAC, Inglot, Estee Lauder, YSL and Clinique, I can guarantee with confidence that your make-up will last until the very end of the night! A trial is highly recommended 6-8 weeks before your wedding day to ensure that you are happy with how you will look and feel with your hair and make-up on your wedding day. Victoria believes in providing a professional friendly service to make you feel comfortable and at ease with your final look. At the trial Victoria will carry out a thorough consultation, discussing your skin type, makeup you normally wear, a certain look you would like whether it be classic, natural or glamorous and your colour scheme. A detailed record of the makeup used, the hairstyle created for each bride and takes photographs from the trial; so then your hair and makeup can be replicated perfectly on your wedding day. Victoria also offers comprehensive make-up lessons, ideal for those wanting to perfect their make-up skills or for brides who are getting married abroad. If you would like something a little more exclusive, have your makeup airbrushed. Victoria is professionally trained in airbrush makeup, which is usually only experienced by the ‘A listers’ of the TV and Film Industry. This technique involves applying your makeup via an airbrush to give a flawless and weightless finish.